It's not difficult to suspend water in a straw, we've all done it; it's great fun when you're fooling around with your milkshake or soft drink. What's keeping the water from falling out the bottom? When we pull the water up in the straw we provide low pressure (suction) to the top of the straw. This low pressure is balanced by atmospheric pressure surrounding the straw at the bottom holding the weight of the liquid. 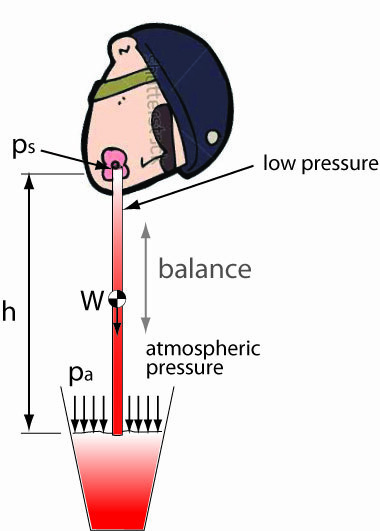 Figure 1 Using atmospheric pressure and suction to suspend water. The key to suspending the weight of water is the capillary seal at the bottom that is created around the edges of the straw. At the surface in contact with the atmosphere forces are generated at the interface of water and air that produce a concave m eniscus related to capillary forces, these forces are large enough in small tubes to maintain the seal. As the tube gets larger, these forces do not get larger and the seal cannot be maintained. This is why if you try this experiment with a larger tube, say 1 inch diameter or more you won�t be able to suspend the water even if the balance of forces suggests that it should. If there is no seal there can be no suspension. But what if the seal could be maintained by some other means? How high could we go and how big a pipe could we use? Figure 2 Using atmospheric pressure and suction to suspend water. If we submerge the end of the tube there can be no issue with the seal. When we do a balance of forces to find out how high we can go we need to account for the pressure at each end of the tube, that's why the height d needs to be considered. However let's make life easier and make d as small as possible or close to zero while still maintaining the seal. Figure 3 The end of the tube is flush with the water level. 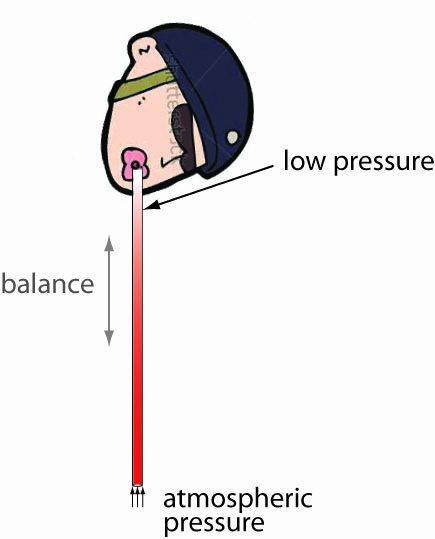 We can use our faithful pressure to head conversion formula to find out how high we can go assuming that we can apply a complete or near complete vacuum (0 psia). The maximum height h is then 34 feet for water. It's fair to say that any diameter pipe would produce the same result as we have a perfect seal. Does this happen in the real world? Yes. Recently on a project I have been working on we came upon this situation. One tank that is higher is draining into another tank lower down. It is required that the line be maintained (i.e. drained) without either tank being emptied. Just putting 2 valves one at each would not allow the line to be drained. It was realized later that we needed an air vent to drain the line. Figure 4. Air vent required to drain line. It was a bit of a head scratcher for many people thinking that a large line would just drain without the air vent but the operation's guy knew by experience that an air vent was required.